A show all about the joys of performing music, Junkyard Band tells a wonderful story about kids living their musical dreams. The 11 terrific songs featured and the themes of recycling and reuse that the show is about even provide for the opportunity for students to create their own musical instruments for the performance. The show is made up of 7 scenes performed by 8 lead characters, a number of smaller speaking roles and chorus groups and explores the themes of teamwork, perseverance, popularity, privilege and self-worth. Set in two locations, the neighbourhood and the junkyard, only a painted backdrop of a city skyline is required. Freestanding flat sets of the neighbourhood and household doors can easily be placed in front of the backdrop to establish the scenes. How do you form a band when you don't have the money for instruments? Four friends dream of becoming buskers but the spoilt and privileged Kylie and her friends laugh at their efforts to raise the funds for their band. The neighbourhood kids help them to start a car wash but Kylie plots to have it closed by the council so they decide to collect second hand goods and plan to sell them to Mr. De Souza, the junkyard owner. Mr. De Souza has a secret musical history and helps the kids realise that they can make music in many different ways which don't require money. They create marvellous percussion instruments from recycled materials and together with the neighbourhood kids stage a fantastic concert in Mr De Souza's yard. After this success the band is even selected to play at a national recycling expo! 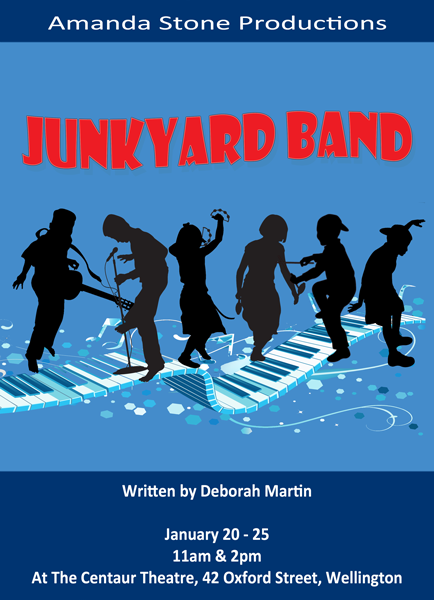 Junkyard Band features 4 main characters, a number of smaller supporting characters and 3 different chorus groups. The show is able to support a large range of cast sizes with children able to play multiple characters for smaller casts while chorus groups can be expanded to support larger cast sizes. The four kids, Ben, Sophie, Pip and Tim are the main characters who are trying to start their own band but they lack the money needed to buy instruments. Ben is the leader, Sophie is considerate and enthusiastic, Pip is bubbly and Tim is the moody one of the group but becomes more cooperative as the plot develops. Kylie and her friends are nasty and spoilt characters who are trying to prevent the kids from achieving their dreams. Kylie's Dad, Mr. Maclean, is disappointed that his daughter is acting the way she is and wishes that she would change for the better. Mr. Maclean also has a dutiful and efficient assistant by his side. Mr. De Souza is the colourful owner of the junkyard who shares his musical past with the 4 kids and helps them to realise their dreams. Also featured is the music store run by the local eccentric Leon and his staff. The 3 chorus groups featured are the neighbourhood kids who are involved in the 4 main kids' attempts to raise money, customers at the music store and homeowners in the neighbourhood.